Damn, thought/hoped it was the wireless versions, would have been a steal! Huh? This portable active stereo speaker weights just 1.20kg, which means it will go whereever you want it to. Recharchable Lithium-Ion batteries are built into the Stockwell, which gives it 25 hours of playing time. Decent saving but (sadly) sound quality is subpar. I bought a set of these a while ago, but returned for one reason - humming in the right earpiece. The build and sound is excellent (in my opinion), but I just couldn't ignore the constant humming, which I could hear when using them at low level. Bought from Amazon, and no issues with fakes. Got this for kitchen and hopefully works well with Alexa...how much did you pay? Does the volume go to 11? Great speaker, I paid £140 and thought that was a great deal! 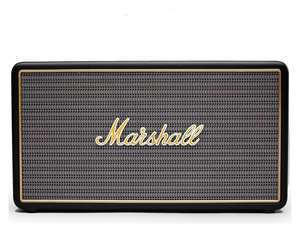 There’s plenty of stock around if you look, I travelled 30 miles for mine after reserving the day before.looks like it’s going to be discontinued as there’s a Kilburn 2 out.The sound quality is rich and deep as you expect from Marshall. Never miss a 'Marshall' deal again! Of course he would - he drives a car with 150k on doesn't he? Currys selling the headphones on eBay for 45 now. Still need to wait and see if the headphones actually turn up....not sure where I stand if they decide not to restock them? They wouldn't do this at the Basingstoke store. 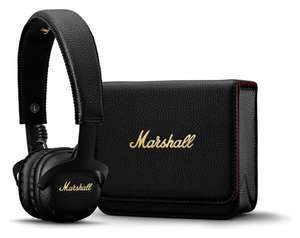 They didn't have a space on the shelf for where the Marshall Headphones would have been. Has anyone tried this deal in other Currys stores? Might go and ask in my nearest in Chingford tomorrow. Has been sat at £129.99 for a while. Great price for some fantastic Bluetooth headphones! If it has a Bluetooth out then yes, But Bluetooth is not good to DJ with as there will always be latency. The headphones come with a 3.5" cable so use that. Can these connect to pioneer ddj 1000 decks? 1:00 into the promotion video says they are 'on ear'. But does it go up to 11? Can't wait til we see audio gear deals on HotUKDeals! 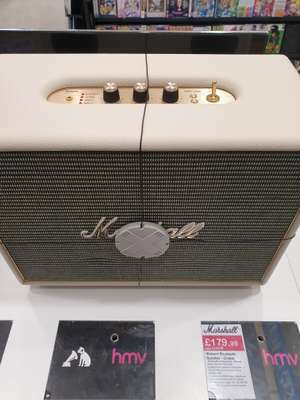 Is there no 12" speakers in this price range? 1x12 would be better than 2x8, you get a fuller sound. I am more of an electric guitar guy, but I recently bought a stage piano and I might get an acoustic amp for that, electric guitar amps distort the signal too much. You're right, my mistake, I was fooled by detachable cable. Yes cheaper but wired. This post is for wireless (Bluetooth) - which gives you both options. I saw this deal too and bought. Arrived yesterday and seem fine though I'm no audiophile. Worried about fakes as Internet says fakes are rife and also very very hard to spot. A YouTuber has demonstrated difference between fake and real Major IIs which is handy but no such video for the Major IIIs. That said, if AO.com they should be legit? Anyway, great deal. Should have posted myself really. Thanks. Just picked mine up. Would this be a big step up from my Bose soundlink mini 2? Do these go up to 11? All these comments are getting me wanting these badly. Best wireless headphones I've ever owned, and the advertised 30 hour battery life is underselling it. I always get 40+ hours. Used mine almost daily for 3 years now. Great price! Does the volume go up to 11? 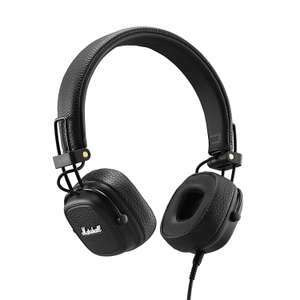 Jabra Move is fairly similar in spec with these. Main difference being the Jabra Move has lower impedance. These Vs jabra move? Similar price. Techradar so the sound quality of these is not great? Just got mines from Curry’s.sounds really good so far.very solid.quite heavy. I would be very surprised if the B&amp;O Beoplay A1 for 20 quid more doesn't blow this away sound-wise....but heat added for price.